I will not live in the same rooms as the Borgias lived. 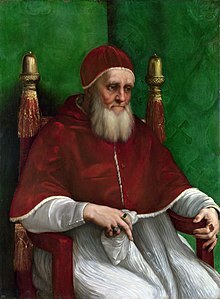 Pope Julius II (5 December 1443 – 21 February 1513), born Giuliano della Rovere, was Pope from 1503 to 1513. His papacy was marked by an active foreign policy, ambitious building projects, and patronage for the arts - he commissioned the destruction and rebuilding of St. Peter's Basilica, plus Michelangelo's decoration of the ceiling of the Sistine Chapel. By his modesty. his readiness, his prudence, and his other virtues he has known how to earn the affections of every one... The damsel, either out of her own contrariness, or because so induced by others, which is easier to believe, constantly refuses to hear of the wedding. I will not live in the same rooms as the Borgias lived. He [Pope Alexander VI] desecrated the Holy Church as none before. He usurped the papal power by the devil's aid, and I forbid under the pain of excommunication anyone to speak or think of Borgia again. His name and memory must be forgotten. It must be crossed out of every document ad memorial. His reign must be obliterated. All paintings made of the Borgias or for them must be covered over with black crepe. All the tombs of the Borgias must be opened and their bodies sent back to where they belong — to Spain. This page was last edited on 17 March 2019, at 22:12.